Madini is a provider of various fragrance oils * in the like that is sold in many Middle Eastern souks' perfume booths. Some of their oils are single notes compounds; some are replicas of commercial designer fragrances (i.e. : Angel, No. 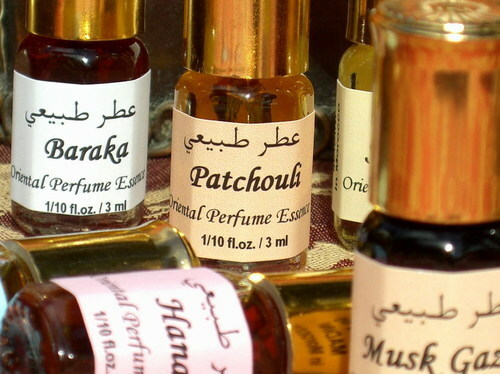 5 and other best-sellers), and some remain true to the Arabian style of perfumery, even if made with cheaper raw materials. Traditionally, a perfume business runs in the family, and the father passes the art and wisdom (selecting oils, etc.) to his sons (it is primarily a patriarchal system, though it is changing), and I gather Madini have been around for 400 years. The vendor (who nowadays rarely is the perfumer) will either bottle it as it is in an ornamental-looking bottle with a dauber, or in a simple roll-on - or if you wish, will blend it for you in some alcohol so that you can spray it. DPG can be mixed in both oil and alcohol, and that's the advantage of this material, besides it being very cheap (unlike jojoba oil). "The sweet and most celebrated flower of North Africa. Considered by many to be the most precious of floral ingredients, certainly one of the costliest". Given that it is sold for $25 for a 6 mL bottle (which brings it to roughly $125 per oz), I can see how someone may be inclined to think they are purchasing pure jasmine. This is not the case. This is simply a jasmine-like concoction of mainly (if not solely) synthetic molecules that is designed to replicate jasmine. It is not far off the jasmine base that I've described in my earlier article on jasmine, and is very potent. Certainly not something that I'd recommend wearing neat on the skin. It's just way too potent and harsh that way, and goes up your nostrils with a bit of a stinging sensation. Okay, now I've diluted it to a normal eau de parfum concentration (in alcohol). Much better... But still, it's very cheap-smelling, and not convincing enough as a jasmine. I'm pretty sure that if it were to be blended with other notes, it would be okay, for example: if it were to be blended with fresh, citrusy or herbaceous essential oils, or with a true patchouli essential oil base - it will give it some more soul. Overall, it still smells flat, chemical (a combination of acetone and something else that still maintain a green sharp ice-needles in my nose, even after dilution). There is a hint of indole in the base that makes it feel a tad more real than other cheap jasmines I've smelled lately, but I would not wear it on its own as a soliflore, because it is just too harsh and sharp this way. But either way, I'm sorry to say that this goes down as a scrubber. I couldn't even do that too well - so I layered it with Brin de Réglisse and now I can breathe a little better... At least for a little while - the jasmine creeps up again after an hour or so, making both a scrubber once more! For that price, or a little bit higher, you can get yourself a sample of pure jasmine absolute from a reputable supplier such as White Lotus Aromatics or Eden Botanicals, and dilute it in an oil of your choice (or get the jojoba-oil 10% dilution). I guarantee you will enjoy it much more. If you are interested in authentic, modern-day Arabian perfumes that are all-natural and beautifully crafted, I recommend you visit Amal Al-Kuwait's website. They are the real deal, and their Fatima perfume has loads of natural jasmine grandiflorum absolute, along with oud.